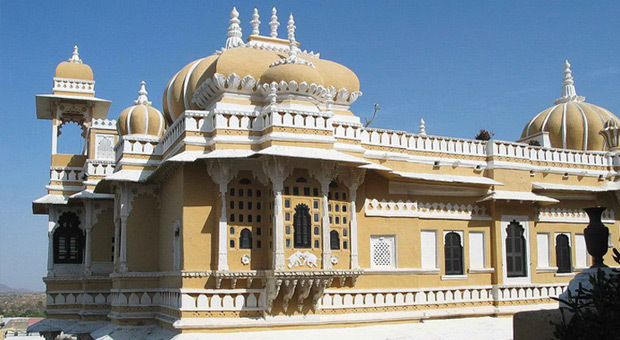 As soon as you glimpse the Deogarh Mahal, you can see that its rulers must have been serious players in the Mewar aristocracy, their magnificent fort a fitting stronghold for one of its sixteen “umraos” - the most senior feudal barons attending on the Maharana of Udaipur. Even so, you might not necessarily guess that the Rawats of Deogarh (a local title equivalent to “Raja”) once ruled over the fourth largest jagir in the whole of Rajasthan. At its most extensive, their territory comprised some 210 villages, with one of their defensive forts as far as 100 km away. Yet there is little ostentation and even less gold to be found in their palace. Like most of the Mewar nobility, they spent too much time fighting to have much to spare for amassing great wealth. It is the public face of the Deogarh rulers that we encounter first. The gateway into the front courtyard passes beneath the “Kacheri” where justice was administered - reminding us immediately that they held powers of life and limb over their subjects. Then the richly painted palace entrance leads us up, past a couple of small family shrines, through a series of narrow passages and staircases. (A grander entrance route would have been harder to defend!) But notice how well-worn the steps are here, compared with other parts of the palace. This is the area that saw the heavy traffic, the villagers coming to pay their feudal dues or seek some judicial remedy. Their business took them only as far as the first floor, where the revenue and general administration departments were located at the front of the building. Emerging onto the second floor where the hotel’s house keeping desk is now located, it is difficult to imagine that this little “piazza”, proudly displaying the white marble Deogarh throne, was a relatively late addition to the palace. Not the surrounding buildings but the actual floor on which you are standing. It used to drop straight down to a garden on the level below. There is another room on the first floor, exactly like the bar lounge immediately above it on this level, giving the building a symmetry that has now been obscured. But originally, if you had wanted to cross from here to the Bar on the other side, you would have had to use one of the narrow galleries that once encircled this space. Contact us now, rediscover yourself !